These projects are a few months old now but better late than never, right?? As we all know, the DIY perusing on Pinterest is a slippery slope. Before you know it, you have a board of projects completely out of your element and 17 projects you want to complete in one weekend. You spend 2 hours in Hobby Lobby, get home, unload your bags of craftiness and feel invincible. I like to call this THE CRAFT HIGH. It is quickly followed by the THE CRAFT LOW as soon as you begin your project and realize you forgot to pick up more glue sticks for the glue gun stopping you dead in your tracks. The first project I decided to tackle was some art work that I actually collected all the materials for a while back and never got around to making. I’d been saving toilet paper rolls for this one for a while. I had the canvas left over from a 2-pack I bought for a Mothers Day gift I made last summer and the paint was already on hand from painting my red table, I had the white in my craft box as well. So, a little cutting, painting, drying and hot gluing later, and I had this. I used in a collage wall in my kitchen. I’m still looking for the right thing to add in that little hole underneath it to even out my square. Any ideas? I’m open to suggestions! I was really pleased with how it turned out and the “H” I made with the placement of the toilet paper roll cut outs was a complete coincidence. I didn’t even notice it until I hung it in the collage on my kitchen wall. 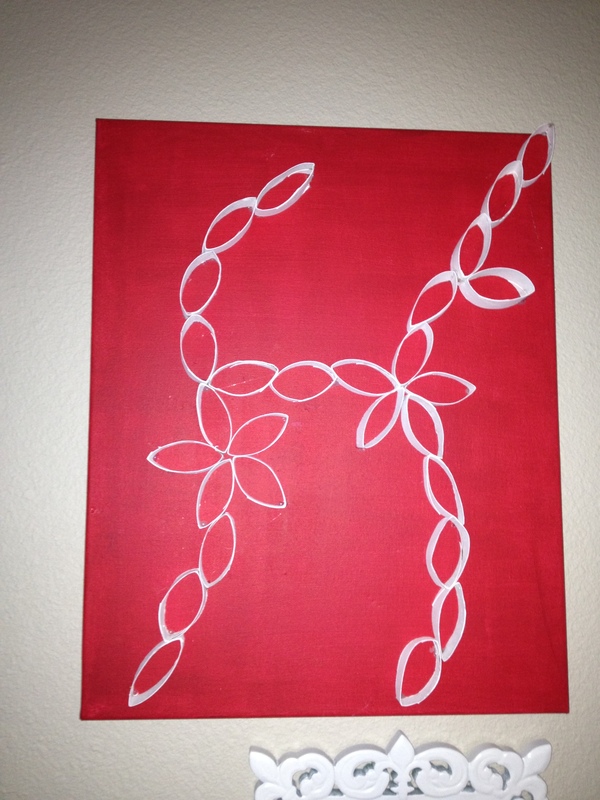 I obviously love my initials, even subconsciously! 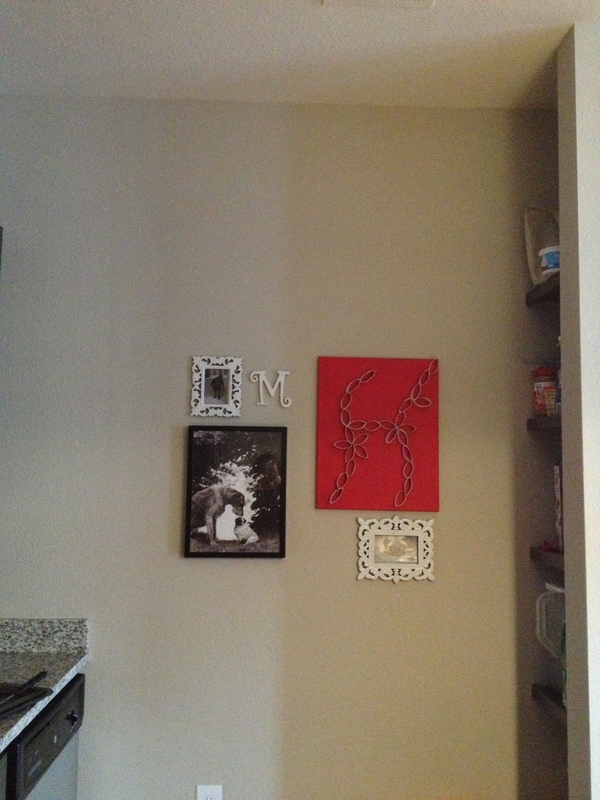 I like that it brings some of the red in the living room into the kitchen and brightens up the wall. It was definitely one of the easiest and cheapest projects I’ve ever done. I highly recommend it to anyone wanting a thrifty project to interject some color. It also would be good with kids. And creating multiple canvases for a wall of them would be cool too. My other project didn’t quite go as I first planned. 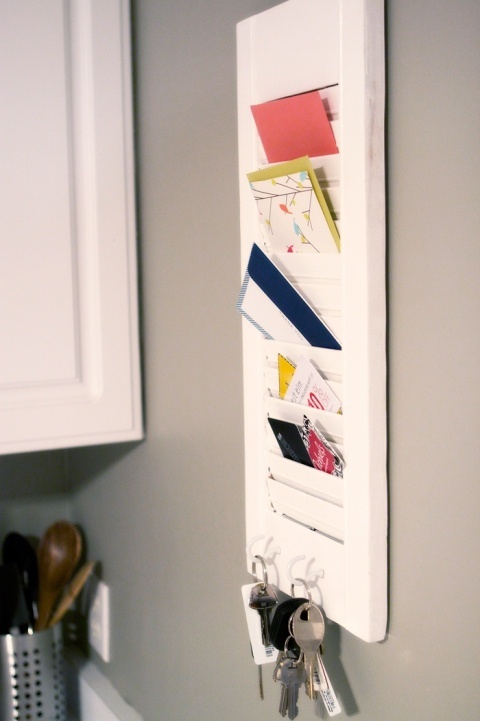 I had wanted to create a mail organizer to hang by the door. 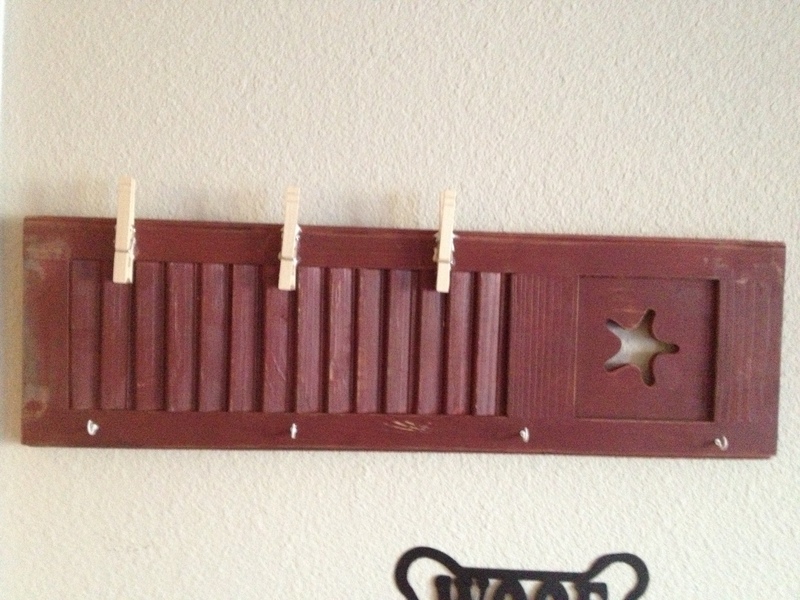 I loved the idea of using an old shutter like this example I found on Pinterest. So, on a complete whim, I searched Craigslist for a shutter and found this one for $10 and *BONUS* it was already painted red!! So, I picked it up from the sweetest lady who even invited me in for dinner. But I declined and left with my shutter. When I got home, I realized this wasn’t actually a working shutter but a decoration shutter that had been glued shut, thus not allowing me to slip mail in between the slats…major bummer. But I did decide to take it home with me for Thanksgiving to see if my Dad could help me add some hooks for hanging my keys by the door. But I had the epiphany on my drive home that I could add some clothes pins to do some mail holding as well! So, a few screw in hooks, some gorilla glue and a couple clothes pins later, I was really excited with how it turned out. This last project was one I had been wanting to do for a long while. I already had the yarn and decided they make a great addition to my adder shelves. 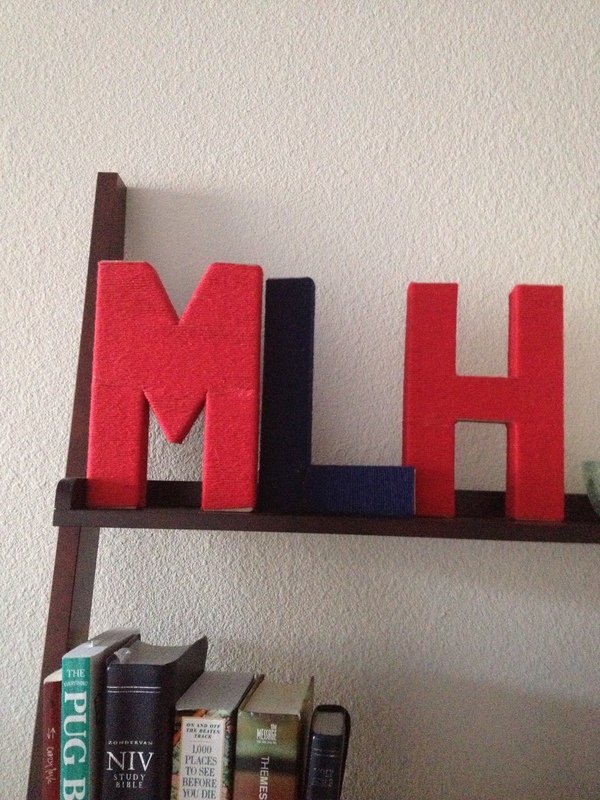 So I swung by the good ole’ HL and picked up some cardboard letters for $1.25 each and wrapped them with yarn adding Elmers glue along the way to keep it in place. Believe it or not, the L was the hardest of the bunch. These look great on my shelves and I recommend these to the craft challenged and also those who are looking for a personalized gift. They would make a great baby shower decoration and gift as well. I finally got my router working at my apartment! There should be a good bit more blogging going on now. 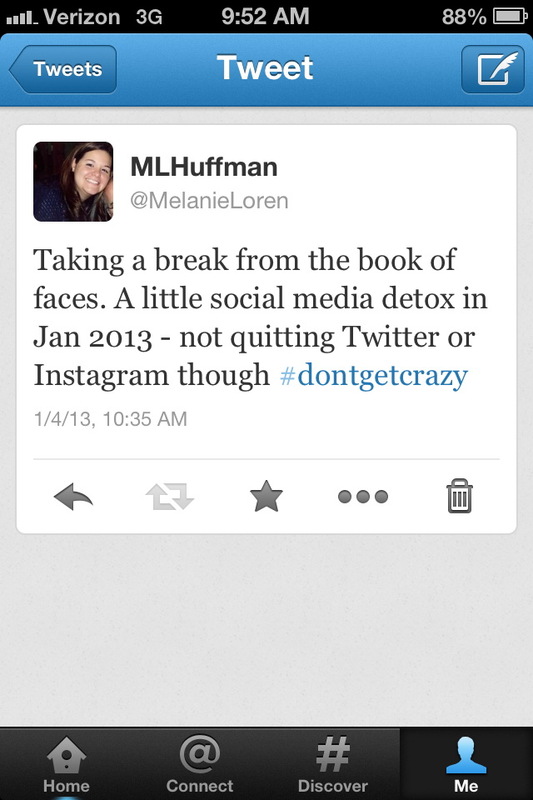 AND my DIY posts are no longer being held hostage. I started running again today. With the annual trip to run in the Cooper River Bridge 10K coming up, it was time to get back on the treadmill. I got 2.5 miles in and it wasn’t absolutly horrible. So, I ‘m counting that as a win. I am reading a really great book. Stay tuned for my review once I finish it. I made home mad moose munch tonight. Bag of popcorn, mini marshmallows, melt chocolate chips and drizzle over on cookie sheet and pop in fridge. Try it, thank me later. Did I see possible snow in the forecast for this coming weekend? Thats pretty exciting! Any high points for you lately? In the beginning of January, I mentioned in this post that I was looking forward to doing some volunteering this year with Hands on Charlotte. Well, this past Monday was my first official volunteer effort and it was a huge success. I signed up for an opportunity called Pet Visits in which well bahaved dogs and their owners make a trip to a nursing home to visit with the residents. I was somewhat nervous about taking Bog because although he is well bahaved 99% of the time, he tends to act out at the vet sometimes. With a similar tile floor, white walls, and sterile vibe as the vet, I was worried the nursing home might put him in the same place. But, I figured it was worth a shot. So, I headed over Monday night with Bog and a pocket full of treats in hopes to get the best out of him. He of course was just excited for a car ride. Oh, the simple mind of a canine. When we arrived, there were a few other dogs and owners waiting in the lobby. A black lab named Finley, a golden retriever named Jordan, a poodle mix named Lucy, and a recue mutt named Lucky. Bog was definitely the smallest of the bunch. After getting aquanted with everyone, we went over the general guidelines. We would walk through the halls, knock on open doors and politely ask “Do you like dogs?” If they seemed interested, we would bring the dogs in one at a time to be pet and make small talk and then move on. Simple enough. Lucky, the veteran of the group, led the way and we all paraded down the hall. The first few rooms were dog lovers and we were able to bring huge smiles to their faces. A few of them wanted to tell us about their dogs they used to have and asked if they could keep ours. The big dogs always got the same reaction, but then when I would bring Bog over, it was always some sort of “oh look at his wrinkles!”, “oh he’s so pudgy”, “oh that curly tail is so cute”, or my favorite “where is his nose?”. He was always greeted with a smile simply for the fact that he has that so-ugly-hes-cute thing going on. And Bog LOVED it. The attention was like Christmas morning to him. He loved getting in the beds with a few of the residents and greeting those in wheelchairs. He would let them pet him and he would just wag that tail letting them know he was so happy to be there in that moment with them. They frequently called him a bull dog and a few even said they remembered him from last time. I just smiled and would agree knowing this was his grand debut at White Oak Manor and agreed to bring him back to see everyone again soon. As we went from room to room, Bog would stay close and sit down right next to me as we waited for the other dogs to make their visits. It was like he just knew what to do. The nurses fawned over him and would ask if he snored at night. They all got a big kick out of him and he loved the attention of course. Not once did he jump up on anyone or act scared. It was like he knew he had a job to do and he did it. All the other dog owners couldn’t get over how well behaved he was and didn’t try to stray away like their dogs. He just knew to be calm and patient as we made our way through the building. After about an hour and a half of visits, we all went our seperate ways and Bog finally got his reward treats in the car on the way home. I was so proud of him. I told a friend the next day that it almost felt like being the parent of the kid that won the spelling bee. He was a natural. And I’m proud to report we have already made plans to visit another area nursing home at the end of February. I’m hoping to make this a regular volunteer effort that we can help with. I got so much out of it and I dare say he did as well. I didn’t take any photos at the home out of respect of the resident’s privacy. 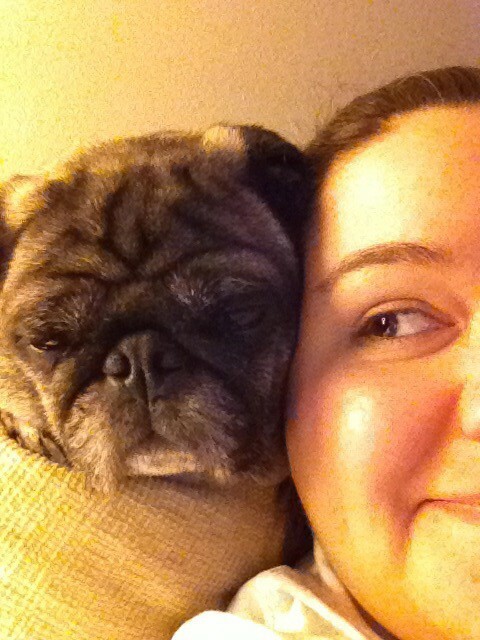 But I did Instagram this little gem of my sleepy boy on the back of the couch resting on my shoulder once we got home. Yes, he is really this sweet all the time. I’m one lucky dog owner. Ok, I’m done bragging now. Do you have any moments your animals have you bragging about them about? Please let me know I’m not alone in this. A good friend of mine lost her dad this past week. It all happened so quickly that I think everyone who knew him are still in shock that he is gone. Within the span of 3 weeks, he was diagnosed with cancer, given a week to live, moved to hospice, and then passed away at the young age of 52. He was a very loved member of the community and church. The outpouring of love on their family was amazing to witness. His funeral was definitly sad but was approached not only as a way to say goodbye but to celebrate his life. So many times we think the funeral is about being sad and not allowing yourself to laugh or crack a smile. But his funeral had laughter as stories were told about some of the jokes he pulled and smiles were cracked as pictures of him with friends and family scrolled through on the projector screen. It was a time of rememberance and celebrating a great man who made an impact on a lot of people. A man who left a legacy. Being a daddy’s girl myself, my heart of course went out to my dear freind who no longer has her daddy. She no longer can call him when she has a question about her car or needs advice about her next step in life. And the truth is, that could easily be any of us. None of us are promised tomorrow and neither are our loved ones. Even though she misses her dad dearly, she was brave and strong enough to give a touching eulegy about the love only a Dad and a daughter can understand. He was so proud of her and it is evident in the way he raised her. She is who she is because of his influence in her life. What an awesome testiment. He lives on through her. Throughout his funeral, a verse found in 2 Timothy was read several times that was fitting for her dad and his sudden call to go home. 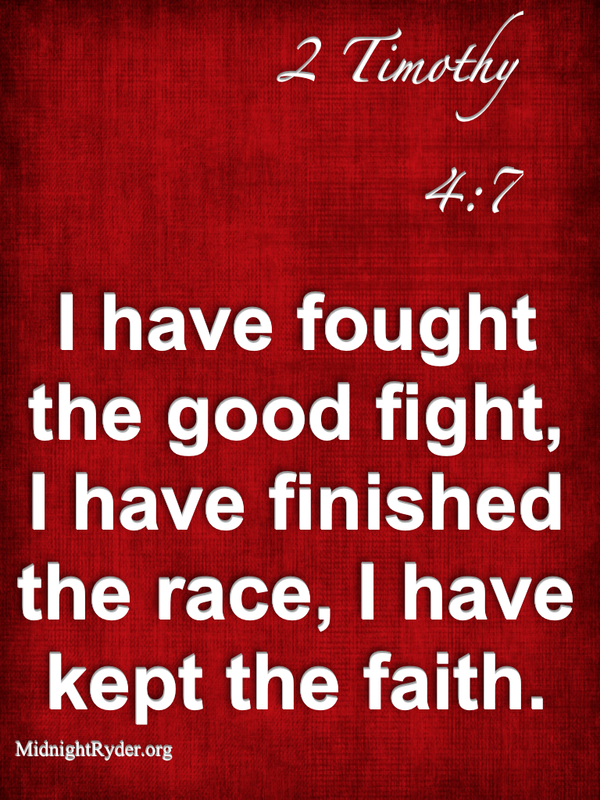 It was 2 Timothy 4:7 which reads “I have fought the good fight, I have finished the race, I have kept the faith.” I don’t know about you but I hope that’s said about me someday at my funeral. What a great way to be remembered. It’s really caused me to think this week about what I fill my life with. Is it things that will leave a legacy and will make my friends and family say “she fought the good fight”? Am I running the race to the best of my ability? Have I kept the faith? I hope to be more concious of this on a daily basis. And I encourage you to do the same. As for my dear friend who probably doesn’t read this little corner of the web, I hope you know you are loved. 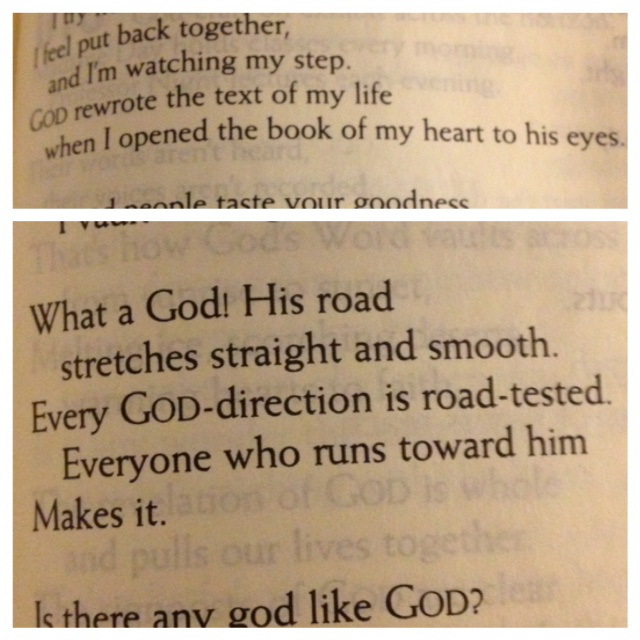 1.Psalms 18:24 and 18:30 from one of my morning quiet times this week. 2. Close ups of sweet old man pugs. 3. Goldfish fulfilling thier soupy destiny. 5. Holiday mashmallows in my evening hot chocolate. 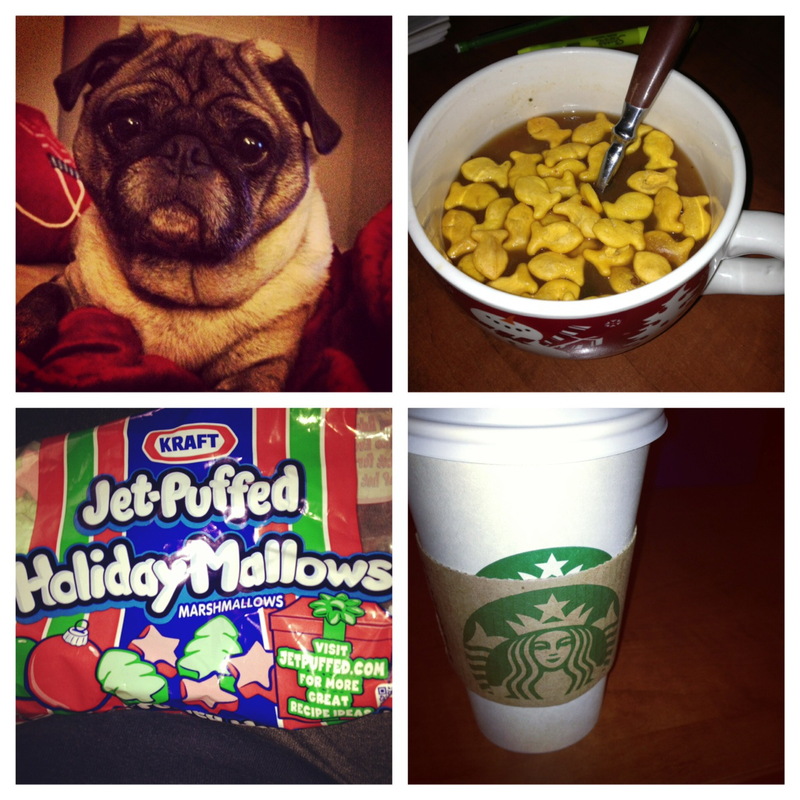 Link up with Lauren and share your favorite 5 things from your week! 15 = The amount of vacation days I have for 2013. Also the amount of days I need to get the heck out of dodge and enjoy myself this year. Maybe somewhere tropical for a few of them. Any takers? 3 = The amount of Hobby Lobbys I visted trying to find all the items for 1 Christmas gift I wasn’t able to finish until the first week of January. For the record, I visited Hobby Lobbies in Charlotte, Burlington, and also Nashville. It was a grand Tour de Craft Stores, if you will. Good times. Not really. 90 = The amount of minutes in the Hot Stone Message I will be receiving in a few weeks after my work trip. Now that’s a good Christmas gift. Men, take note. 11:00 = The time of morning next Wednesday I will be laying in a dentist chair receiving the lovely gift of a filling. I went almost 3 years with no fillings. Drat. 29 = the age I turn this year. Holy approaching 30, Batman. Not sure if I’m ready to turn that number. Good thing I have till September to get used to the idea. 3.5 = the amount of DIY blog posts being held hostage on my laptop until I get a router for my apartment. I know, how ridiculous that I’m paying for internet I can’t even use at the moment. What. A. Slacker. I blame the holidays. All of them. Even you, Kwanzah. 4 = the amount of days I’ve gotten up at O’dark thirty to get my run on at the gym. That’s right. Be impressed. 4 = the amount of times I FROZE as I walked in the dark to the gym room to run. Ready for spring, party of 1. 2 = the amount of wreaths still hanging up in my house. That’s right, I refuse to take them down. 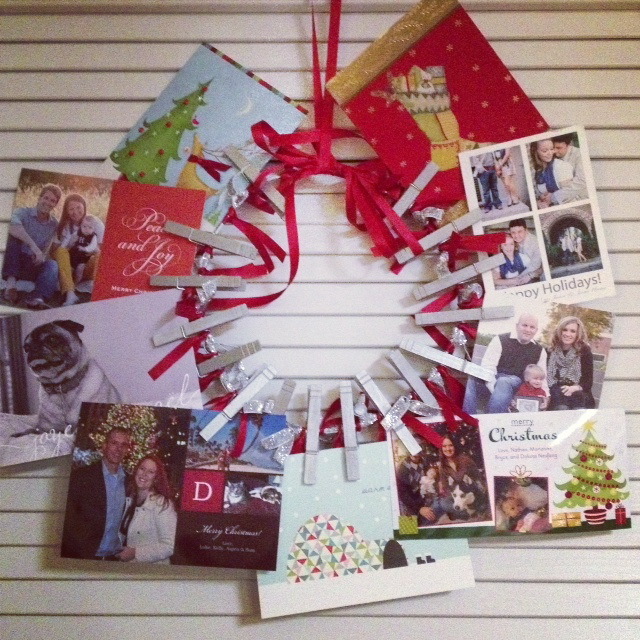 For 1, my friends work entirely too hard getting their Christmas cards out to pack them up right away. So, I’m enjoying them until February. And 2, my front door wreath is more Winter Festive then Christmas. 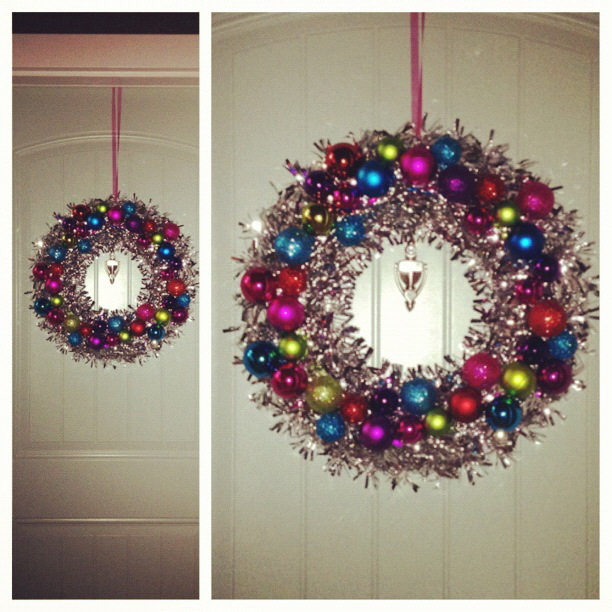 ALSO, this is probably a little late, but I made that sparkly front door wreath for under $10! I found the silver tinsel wreath at Home Depot for about $4 and I bought 5 or 6 tubes of the multi-colored plastic ball ornaments in the $1 section at the Target. Enter glue gun and boom – new festive wreath! I highly reccomend it if you scored some good after Christmas ornaments or wreaths this year. Any important numbers to you this first month of January? This whole “living by yourself” thing has taken some time to get used to. In the beginning, the quiet was TOO quiet for me and not having someone else in the house to talk to was strange. 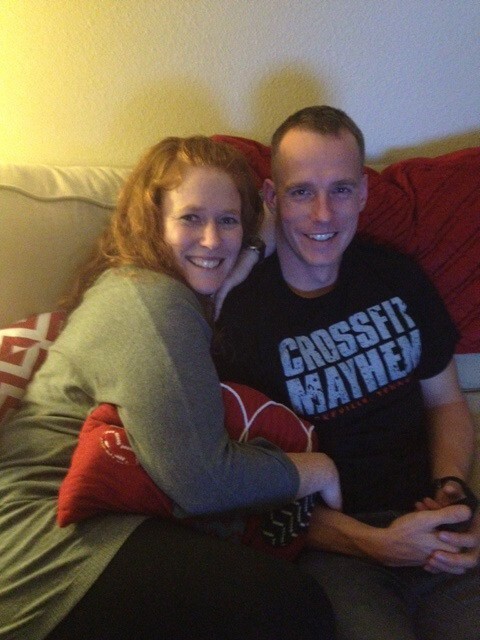 But now that I’m a month in, I’m happy to report…I LOVE IT. I love that my apartment really is a haven and I look forward to coming home to the quiet most days. 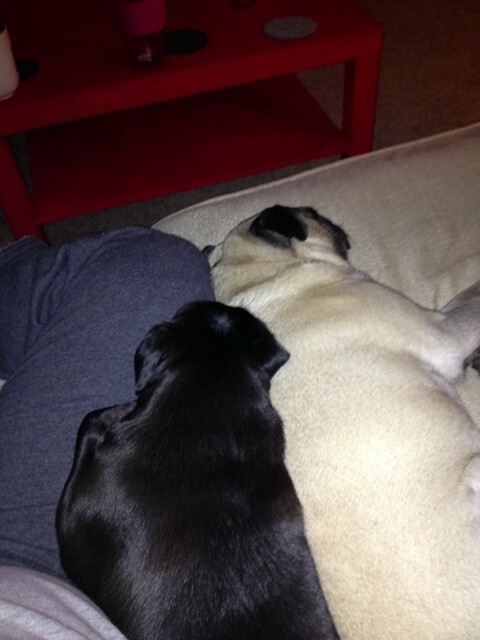 The pugs have adjusted well and are actually starting to get along better than I imagined. I’ve caught them napping on the couch together twice and if I’m on the couch with them, this is usually what ends up happening. 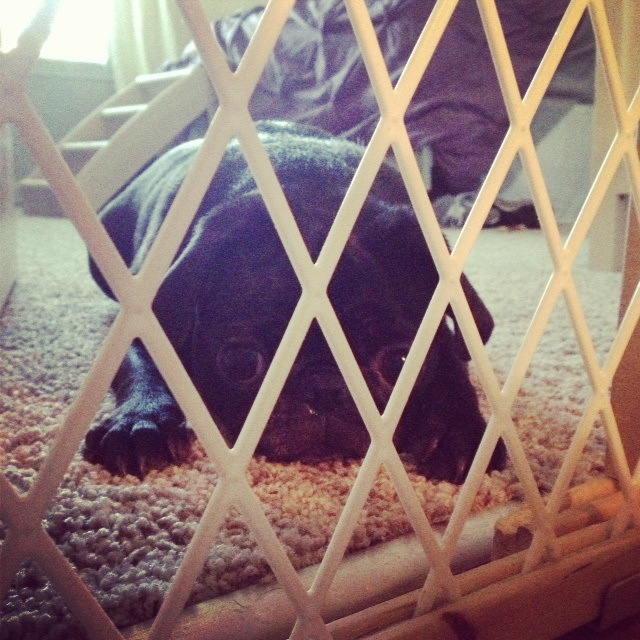 Because Penny is still very much in puppyhood, she does need a timeout now and then. She runs circles around Bog and sometimes we both need a break from the crazy. So I block her in my room with the babygate. She doesn’t fight it though. She tends to just fall asleep waiting for timeout to be over. 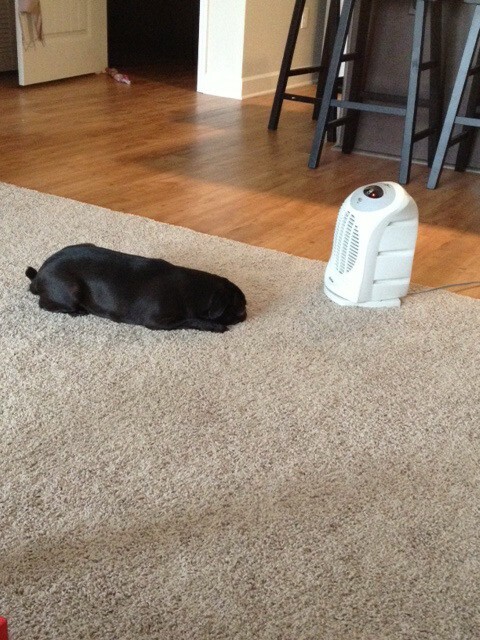 Speaking of Penny, she also has a new love for the space heater. Because my place isn’t all that big, I’ve been avoiding turning the heat on. So, I run this little heater for a few hours while I’m home and it heats it up pretty quick. Penny has discovered this is where the warm air comes from and this is her new favorite spot. See ya 2012, Come on in 2013! Well it’s that time of year where we begin our detox from the holidays, take a few moments to reflect on the year, and look forward to what is to come. In a world of peaks and valleys, 2012 was a bit of a valley for me. But, the valleys are what make the peaks so great, right? 2012 was a year of learning hard lessons. It was a year of going through some tough spots put in my path to make me stronger. It was a year of sorting out relationships and learning some things about myself. So, as 2012 ends, I may have a bitter taste when it comes to the learning curve I found myself in, but I am hopeful. Hopeful that 2013 will be a peak. I have the usual New Years Resolutions that everyone starts off with. Become healthier for one. I’ve already been on this train for a while but it’s time to kick it up a notch. Running and I WILL become friends again if its the last thing I do. The gym at my new apartment complex will be a huge help in this department. If only I wasn’t a first class snooze-hitter. Enter Resolution #2: Learn not to hit snooze. I also feel like it’s time to start crossing off some items from my life list again. I haven’t exactly crossed anything of significance off in a while. I’m actually ahead of the game and already have a plan for one of them. In particular, volunteering my time for a year. Back in November, I decided to go ahead and look into some oportunities in my community to help out with and I came across Hands on Charlotte. I signed up and actually just finished my orientation hours just a few weeks ago. So, I’m set. I’ve got the t-shirt to prove it. The opportunity I am most excited to try is called Pet Visits. It involves getting to take Bogart to a nursing home to visit the elderly twice a month. No training required for this one, just a sweet dog that minds well. So, I thought Bogart fits that description just fine. He’ll get to go visit with residents who probably had pets themselves and miss having a dog around. I think it’s going to be a great chance to help out and bring some smiles to some faces. There are all sorts of other opportunities I’m going to dive into as well like helping with some Bingo Nights and some building projects around the city. I’ll keep you posted and if you are in Charlotte, I strongly encourage you to help out as well! I’m also going to do more cooking and also try to do more reading. I feel like I say those every year and probably do. But it’s good to throw them out there. So, as 2012 ends, I hope you are ready for 2013 as well. Was it a peak or a valley year for you? As I sit here in my hotel room after a 9 hour work day half way through my work trip, I can’t help but think about this season of change I’m going through. I was reading through some of my favorite blogs tonight and I came accross Gussey Sews post about finding peace in her season of change. Her season is WAY different then mine since she’s A. having a baby and B. she just moved to LA from Minneapolis. But, I really found comfort in knowing that everyone has seasons of change and it’s totally normal to be freaked out by them. Sometimes I forget that. But as she said, it’s important to find your joy not in a person, job, house, or any other worldy thing. But find it in Him. You know, the uppercase Him. The big Him. Why is this so hard to remember? I feel like I need it stamped on my forehead. I get so bogged down with feeling worried about relationships disolving, obsessing about whether I’m on the right path, and don’t even get me started on the future. But it seems like just when I start getting burried in worries, I’m softly reminded that I should stop and be joyful in this time. Be joyful in times of worry, for there really is no reason to worry. Are you all having trouble with this as well? Is it tough to find your joy sometimes? Moving Day and Creating a Living Room On The Cheap! Well, I moved! Again. This one was practically painless. In fact, I often felt like I was just waiting for something to go wrong. How pessimistic, right? But as we all know, moving almost never goes exactly as you planned. But this time, it really did. I had some great friends to help and the move went off without a hitch. After moving all day Saturday, I went back to M’s house one last time to get the dogs and the last few things. I had promised her earlier in the week to not make the goodbye that big of a deal. She’s not into getting sentimental. After all, we’re still friends and it’s not like I’m moving across the country. But, after living together for 7 years, it WAS a big deal. But I had promised. 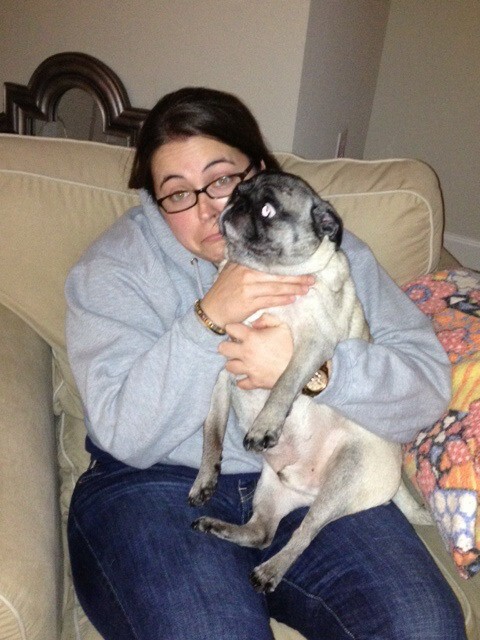 So we hugged one last time as roomies and I headed to my new place, 2 pugs in tow. I unpacked the rest of the night, ran to Subway for a quick dinner around 8:30, and then I made the huge mistake of sitting on my couch. It was all over. Seriously, ya’ll. That couch is the best FREE item that has ever crossed my path – but more on that later. Sunday I got all the unpacking done and I even stuck it out and hung the curtains in my room and set up all my Christmas décor. It is December, after all. I wanted to get as much time with the glow of the Christmas tree as possible! I would leave it up all year if I could, y’all. So, back to the place. Here are a few blurry iPhone shots I took Sunday after I cleared all the boxes out. I plan to take some better ones with some natural light later on. Please excuse the black lump on the arm of the chair. It’s just a very sleepy pup. So, yeah, not bad, eh? Now that I’ve posted some pics, I wanted to give you guys the dirt on how I went from having 1 side table and some shelves to furnishing my living room in less than a month. All, I have to say is Craigslist is the bomb.com. I started off with a general list of things I was going to look for. I also emailed this list to my Mom who also scoured Craigslist in her neck of the woods. Here was my original list. Comfy Couch: FREE from Craigslist. The lady that posted it lived in a tiny condo and had already bought a new couch. She just wanted the old one OUT. So, she posted it for FREE to whomever would come pick it up. After making sure it was comfy and in decent condition, I promptly came back the following Sunday with some strong friends and a truck and loaded it up! The couch is a Bassett Furniture piece, very well made and she originally bought it for $1200 about 12 years ago. Comfy Chair AND Ottoman: Originally from Ikea, found for $125 on Craigslist This one goes to my Mom. She found it, sent me pics, roped my Dad into picking it up and bringing it to me, and even talked the guy down another $25. I do plan on getting a new slip cover due to some stains on the arm but throw a blanket over it and I’ve got at least another few months to mark that one off my list. This chair and ottoman retails for around $400 at Ikea! Floor Lamp: $5 from Craiglist. I met a hippy lady in a Trader Joes parking lot for this one. A little sketch but the exchange was legit. I already had the shade. No original retail amount known but I’m guessing this was probably a $40 lamp brand new. Coffee Table: Found at Ikea in the “AS IS” section fully put together for $19. It was a floor model that had a couple knicks and dings. I bought a $3 sample pot of red paint at Home Depot and gave him a facelift. He (the table) is not perfect by any means but he will do for a while till I feel like upgrading. Originally retailed for $35. TV Stand: FREE from my dear friends Erin & Tate. They are cleaning out an office to turn it into a baby nursery for their 2nd bambino. So, when she offered up a set of shelves, I immediately thought they would do as a TV stand for a while until I find a piece I feel like purchasing. So, I picked them up on my trip home for Thanksgiving. She also gave me a sweet lamp for my little side table I had not originally planned on needing. But it’s come in quite handy! The shelves were probably about $50 brand new. 4 Bar Stools: 2 were FREE from my friend Sally. She moved recently too and no longer needed them. So, I took them off her hands and set out to find 2 more so I could have a set of 4. I found 2 of the same height and style in the Raleigh area for $40 on Craigslist and I sweet talked my Mom and Dad into snagging them for me. So, I got 4 stools for $40 essentially. They were originally $40 each according to the price tags on the bottom of the 2 bought stools. So I basically had a buy 1, get 3 free situation going on! Free Standing Coat Rack: After looking nonstop for one of these on Craigslist, I decided I’m just going to keep my eyes open for one the next few months. For now, the 3M hooks on my wall will work just fine. So there is the probably-way-too-much-information break down of my living room and all the goodies I got on the cheap. A living room that would have originally cost $1885 based on the estimated original prices, cost me a measley $189. So basically, I got my living room for 90% off! There are definitely some things I’m still on the lookout for, like some art for above the couch, that coat rack, and possibly one more chair for extra seating (which a coworker might give me for FREE). But, I was able to pull it all together rather quickly. There is also a GIANT window not pictured above that I would like to DIY some curtains for. But all in due time. Speaking of DIY, I’ve gotten my craft on and have a few which I’ll be sharing soon including my mail/key organizer and some art for the kitchen. But it will be at least a week or so. I’ve been roped into asked to take a trip to New Jersey for work next week. So, I’ll be living out of a hotel and fighting Jersey traffic for a few days. But I will be back! Maybe I will even squeeze in a post while I’m gone. Have you guys scored anything on the cheap lately?? I would love to hear a good consignment/thrift/Craiglist story. I always wear mine as a badge of honor for my thriftiness. As should you!